The important part of SaaS is the word "service". The cloud is only valuable to us if it provides something we actually need to do, and provides that service in a way which is operationally convenient and cost effective. That is not to say that the cloud does not have huge attractions. What you are doing, essentially, is bringing in subject experts to do things that otherwise we would have to worry about. Building, extending and maintaining large IT installations requires not just a hefty capital budget, it needs specialist skills. Scarcely a week goes by without some high profile organisation suffering a security issue: there is a lot of sense in passing that problem on to the experts. In our industry, the core business is in making and delivering great content. Producers and editors want to spend their time shooting and polishing programmes, not worrying about how to keep the footage securely stored, for the duration of the project and beyond. But there are well-known objections to using the cloud in the media industry. Perhaps the biggest challenge is that, while most IP applications have large numbers of relatively small files, we have relatively small numbers of extremely large files. The charging structures of the major cloud providers are set up to reflect their core business and may not be flexible enough for our needs. The ideal solution, then, is to build applications on media-aware cloud storage. At TMD we have been working with our UK partner, ERA, to provide an off-the-shelf, cloud-based archive solution called Coeus. Before we go any further, we should explain the name. Coeus - pronounced kee-yos - was one of the Titans of Greek mythology. To be precise, Coeus was the god of intellect, representing the inquisitive mind. 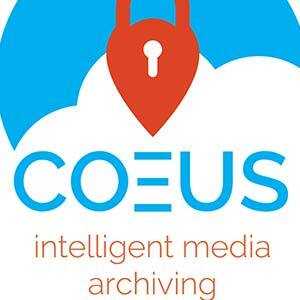 What Coeus does is present an intuitive, cloud-based service for short and long term storage, management and protection of media. To do this, we essentially run TMD's Mediaflex-UMS platform running the Paragon media service application for archive management, in a cloud which has been set up and managed by ERA specifically for media applications. The ERA data centre is in the UK, and its infrastructure and connectivity is designed around media storage. It provides the flexibility and agility that media enterprises need. Most important, the cost structure is designed for media users. Running TMD software in the cloud ensures that the familiar and expected functionality is available. Central to this is something that we now take for granted in an archive application: partial restoration of files. Imagine you are an editor charged with making a suite of trailers for a new drama series. You really do not want to copy multiple high-resolution, hour-long programmes into your edit computer when all you need is a few seconds from each. That is a doubly important consideration when the master content is not on a server network in your facility but in the cloud. Even ignoring download charges, the time taken to transfer tens or possibly hundreds of gigabytes of data would be a complete block on productivity. So the desired cloud archive storage application must include a proxy viewer so the user can browse at frame-accurate low resolution, to choose clips, then recover and download only those clips at full resolution. That is one of the key feature of Coeus. The system has a simple, web-based interface, designed to be used by real people not IT experts. The fact that it is web-based means it can be used anywhere, provided the operator has the right credentials. So if you are shooting on location, your camera operator or DIT can upload the selected takes each day, making them instantly available to the editor, producer and anyone else who wants to work on them or check progress. What we set out to do with Coeus is to create a cloud storage and archive solution which is readily accessible and instantly available. Set-up is simple, archive maintenance is intuitive for real-world users, and costs are clear and manageable. Because the underlying cloud data centre is designed for media files, security structures are appropriate to keep the content from prying eyes. Already we are seeing the industry welcoming this fresh approach to cloud provision, combining the best available software with a media-aware data centre. Because Coeus is self-provisioning in an intuitive way, users are finding that it delivers on the promise of software as a service, providing the key requirements of secure transfers, simple viewing, partial restore for fast and efficient recovery, and practical storage for working materials and long-term archiving.